View (looking northward) of buildings around the main plaza of San Felipe pueblo, with the Rio Grande river in the distance, and Santa Ana Mesa visible in the distance on the left. In the foreground a group of villagers is gathered, and closer still to the camera the collector James Stevenson can be seen talking with a local inhabitant. 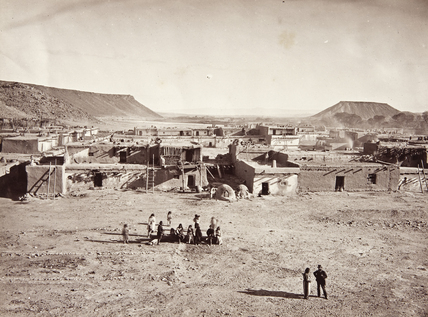 According to Stevenson's original note for this photograph (prepared circa 1885), the 'dwellings of this village never reach higher than two stor[ey]s', and the 'walls of the old pueblo are constructed of well-selected lava bo[u]lders of uniform size'. The photograph was probably taken by John Hillers from the roof of the Catholic church.